The grace period for Aug. 1 tax payments has been extended to Aug. 28. As you may know, mailing of Cherry Hill property tax bills due Aug. 1, 2017, was delayed due to State budget changes that prohibited the Township from preparing 3rd and 4th quarter tax bills. Bills have now been finalized, and will be mailed no later than next Friday, Aug. 4. In the meantime, bills are available to view and pay online by clicking here. The grace period for payments has been extended to Aug. 28. Payments not received by Aug. 28 are subject to interest from Aug. 1. For your convenience, the Tax Collector’s office will be open from 8 a.m. to 5:30 p.m. Monday through Friday from Aug. 18 to 28 for third-quarter payments. For more information, contact the Tax Collector’s Office at (856) 488-7880, or visit the Tax Collector’s page on our website. 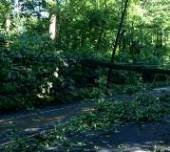 Residents can call Public Works until Aug. 7 to schedule storm-debris collection. A number of residents have reached out to my office to request assistance with clean-up following heavy storms early this week. In an effort to assist our residents in disposing of their excess yard-waste and debris, the Department of Public Works will offer a special collection for storm-related debris and yard waste. For homes who have registered for this program, our personnel will pick up any debris that has been hauled to the curb, and can be managed by one person. You may register for this service by calling (856) 424-4422 until Aug. 7. No requests will be considered after Aug. 7. We cannot accommodate requests to move whole trees or large limbs from private property. We thank you for your patience and cooperation as we attempt to help ease clean-up efforts. For more information, click here. We are counting down to Cherry Bowl 2017! Good luck to all those competing tomorrow in the 58th annual Cherry Bowl, being held this year at Kingston Estates Swim Club. Our Council members are looking forward to once again kicking off the festivities, and welcoming hundreds of community members to one of Cherry Hill's greatest traditions. I want to thank and congratulate all those responsible for planning this year's event, from the Kingston Swim Club executive board, to the Cherry Hill Association of Pools, to the countless volunteers who will make the event possible. It is a tremendous undertaking, and your efforts are appreciated! Kingston residents and those planning to attend the day-long event should note that temporary parking restrictions and road closures will be in place 7 a.m. to 6 p.m. Saturday. You can click here for parking and closure maps. For full event details, visit www.cherrybowl.org. Council President Dave Fleisher welcomed guests to the Al Fresco Affair, Thursday night at Croft Farm. 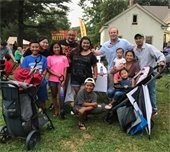 Council President Dave Fleisher was among the more than 100 residents who came out to celebrate our first night of Al Fresco Affair at historic Croft Farm. In its second year, the Al Fresco Affair offers a beautiful evening of great food under the stars, for residents of all ages. If you couldn't make it out last night, don't worry: Night two is scheduled for Thursday, Aug. 31. The event offers some of the area's best food trucks and live entertainment, from 5:30 to 9 p.m. Admission is FREE; food is available for purchase. Thank you to our sponsors at Kennedy Health for their ongoing support. Check out our Facebook event for more information, and let us know you're coming. We hope to see you there! Beginning Monday, July 31, Chapel Avenue westbound will be closed to all traffic at various locations between State Street and the Merchantville Circle from 7 a.m. to 5 p.m., Monday through Friday, as part of a water-main replacement project by the Merchantville-Pennsauken Water Commission. The road will reopen in both directions until 5 p.m. daily. Eastbound traffic will remain uninterrupted 24/7. The project is expected to take about 18 weeks to complete. Closure points and detours may change as work progresses. The Township and Cherry Hill Police Department will make every effort to update residents and motorists on the latest details. As always, please use caution when traveling through a work zone. For more information, click here. South Jersey Gas has notified that Township that it is set to begin work to enhance its infrastructure as part of the Accelerated Infrastructure Replacement Program along Haddonfield-Berlin Road beginning Monday, July 31. The work is expected to be completed by September 2017. As part of the project, SJG will be installing 2- and 6-inch yellow plastic natural gas mains on Haddonfield-Berlin Road, Walt Whitman Boulevard and Ocean Avenue. Work will also take place along side streets, including Baldwin Road, Pippin Circle, Jonathan Court and McIntosh Road near Ocean Avenue. To ensure safe travel, there will be a temporary lane closure on Haddonfield-Berlin Road, with appropriate traffic control personnel directing motorists and pedestrians around all work. In addition, there may be some road closures on select narrow side streets where work will be performed. Residents and businesses along these streets will have access to and from their properties at all times. Work is scheduled Monday through Friday, 7 a.m. to 5 p.m. Residents with questions or concerns should contact the contact the South Jersey Gas Waterford Division at (856) 768-2900 and reference the Cherry Hill Grid 1 project. Click here for the full project notification.A fact sheet is available here. NJDOT is continuing its nightly repairs along Route 70 next week, with paving planned in the area of Brace Road on Monday night, July 31. Crews will operate overnight, from 9 p.m. to 6 a.m. daily, weather-permitting. The project is progressing quickly, but work is expected to continue into the fall of 2017. Ultimately, the project will significantly improve driving conditions on the highway. The Township will make every effort to keep residents, businesses and motorists updated on weekly work schedules, as information is made available by NJDOT. The precise timing of the work is subject to change due to weather or other factors. Motorists can visit www.511nj.org for real-time travel information or follow NJDOT on Twitter @NJDOT_info. Join me, members of Town Council and the Cherry Hill Police Department as we celebrate National Night Out, from 6 to 8:30 p.m. this Tuesday, Aug. 1, on the grounds of the Municipal Building, 820 Mercer St. This annual celebration of crime prevention and community policing will feature an impaired driver simulation course, dunk tank, police obstacle course, touch-a-vehicle, K-9 demonstrations, food, music, prizes and much more. This was a fantastic event last year enjoyed by thousands of men, women and children of all ages - and I hope to see everyone there again this year! Please note: Due to anticipated crowd size, visitors are encouraged to park at Cherry Hill West and utilize the courtesy shuttle being provided by the Township. Parking will be extremely limited in the area of the Municipal Complex. A map of parking restrictions is available on the Township website, by clicking here. For more information, visit the Facebook event, call (856) 488-7868, or email events@chtownship.com or alliance@chtownship.com. Cherry Hill Restaurant Week begins Aug. 6! 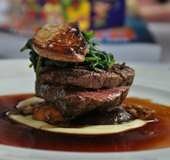 Restaurant Week returns next week! Thirteen restaurants are on board for Cherry Hill Restaurant Week 2017, which returns with a week of specials from Aug. 6-13. For one week, participating restaurants will offer patrons a special prix-fixe ($25, $35, or $40) 3-course menu, with lunch options available in most locations, as well. This is an exciting opportunity to promote local businesses, while giving our residents a chance to enjoy a special meal at a great price. Look for more information, including a list of participating restaurants, sample menus, and updates to the Cherry Hill Restaurant Week website, Facebook page and Twitter account (@CHRestaurantWk) in the coming weeks. And be sure to save up your appetite for the week of Aug. 6! 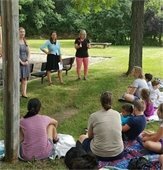 Councilwoman Jacobs welcomed families to Storytime in the Park on Friday.